It is the middle of January and I realise that it has been almost a month since my last distro review which was a review about the latest version of Slacko. There have been a number of new releases announced since the beginning of the year but the one that caught my eye was Manjaro Linux Openbox edition. Manjaro welcomes another addition to the family in the form of our brand-new Openbox flavour. Designed and built exclusively by the Manjaro team, this lightweight, sleek, and super-fast flavour comes with a unique twist – traditional menus are not used to find and launch applications. Instead, the heart of the desktop is Synapse. At first glance comparable to a typical menu search bar, Synapse is in fact a very powerful and versatile tool that boasts a wide range of useful features, particularly due to the optional plugins available. Some of these features include: locating and launching applications faster than menus; accessing specific file types such as documents, pictures and movies…. I have never tried an Arch based distribution before so this was a step into the unknown which is what this year is going to be about for me. I am going to step out of the comfort zone and learn some stuff. I downloaded the Manjaro ISO from http://sourceforge.net/projects/manjarolinux/files/release/. There are a number of different versions available. 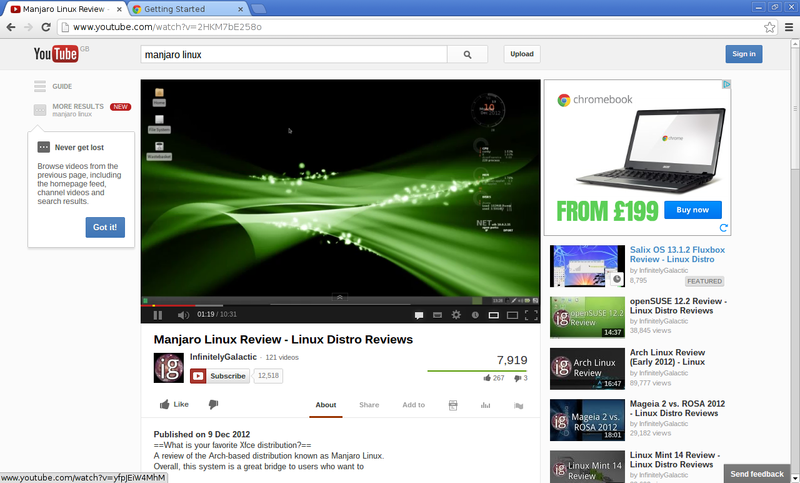 I went for the OpenBox version as this was the version the developers were excited about on Distrowatch. My usual method for installing a distribution is to use Unetbootin to put the distribution onto a USB drive and then boot the live image onto the machine that the distribution will be installed to. Then I install the operating system to the hard drive. This didn’t really go to plan with Manjaro. The download went fine as did installing the distribution onto the USB drive. Unfortunately when I booted the Samsung R20 laptop it showed the Unetbootin menu for Manjaro but would not go any further. I did a quick search on Google and it seems other people have experienced this problem as well. I therefore went for “Plan B” which was to burn the image to a CD and boot from there. This worked perfectly and the system booted into a live version of Manjaro. I had a quick play with the live version and then went for the Install (to do this I had to right click on the desktop and choose Install). There are two installers available, one is described as stable and the other not so stable. The not so stable option handles things such as EFI. I went for the stable option. The install process is actually fairly intuitive. The first thing is to choose the language and timezone. Then you set up the partitioning. You can choose to use assisted partitioning or you can partition the drives yourself. I went for the assisted partitioning option whereby I was asked which drive to use and the sizes for boot, home and swap partitions as well as the file system to use. I generally went for the default options. The next step was to install the system. This was just a case of waiting for the files to be extracted and installed. There were various optional configuration options that were available such as setting locales and keyboard layouts but these were already set for my preference. The final step is to install a bootloader. I installed GRUB. The whole installation is menu based and you go through the menu options one by one until the system is installed. It really isn’t any more difficult than installing Ubuntu except you have a more command line based installer as opposed to a graphical installer. I can imagine for people new to Linux that this would appear more daunting than it actually is, especially when it comes to working out the partitioning. The first few seconds of the boot up were a little bit unnerving. I selected Manjaro from the boot menu and what can only be described as hieroglyphics scrolled up the screen. There was nothing to worry about however because after about 10 seconds the above screen appeared. The boot time is very impressive. I have been using the system for a number of days now and it consistently boots up within 10 to 15 seconds. Other than the stylish wallpaper there is a task bar at the top split into sections. 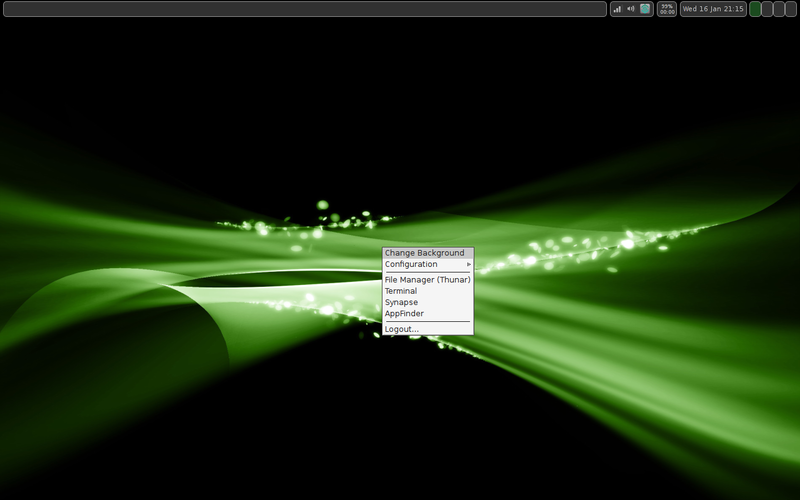 The first section of the taskbar is used to highlight the applications that are currently running. 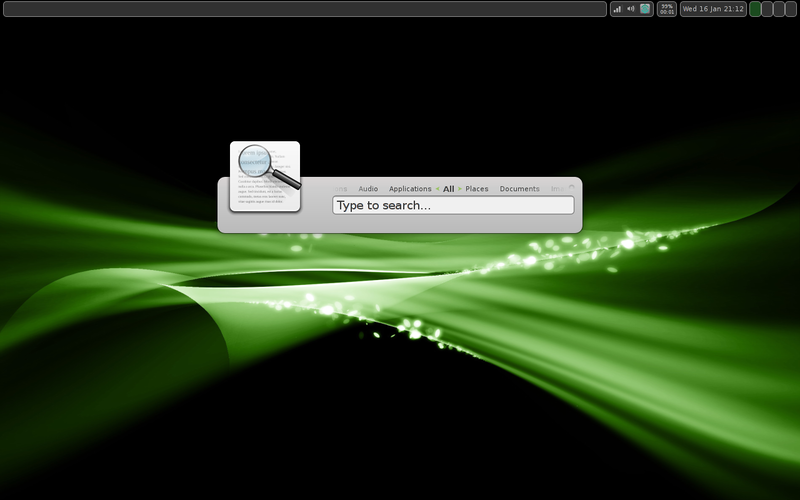 The second section has icons for network connectivity, audio settings and an icon for the Synapse search tool which will be described later on. Following this there is a section which provides the battery status and a calendar. Finally there are 4 boxes to indicate the individual virtual desktops that are available. Manjaro set up my wireless card for me and this meant my home broadband and wireless broadband were available straight away. All I had to do to get online was to click the network icon on the task bar, choose the network I wanted to connect to and enter the appropriate security key. The default browser in Manjaro is Midori which is common among lightweight Linux distributions. 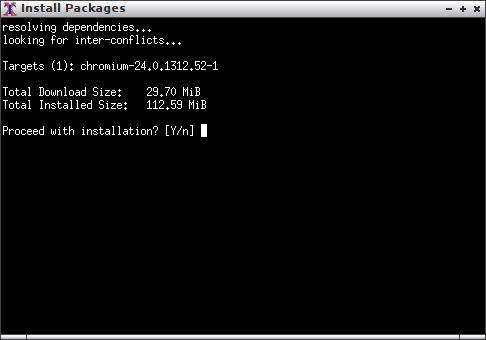 When it comes to doing anything on the internet I prefer to use Chromium which brings us onto the subject of how to install applications. Manjaro is very easy to navigate and I’ll come onto this in more detail later on. 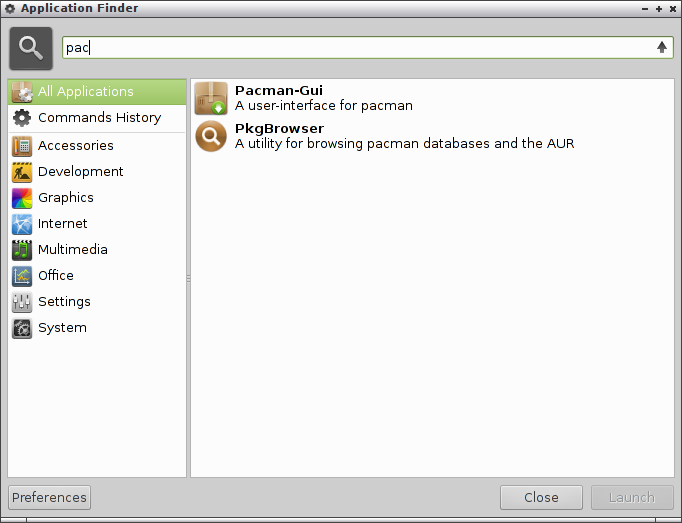 Right clicking anywhere on the desktop brings up a menu which has an option called AppFinder which provides list of applications. If you scroll down the list you will find Pacman which is used for managing packages within Manjaro. The main Pacman-gui screen has a number of buttons for doing various tasks. The first button I clicked was the one marked “Open PkgBrowser”. Unfortunately whilst the application opened I received a number of Python errors. At this point I looked back at the Pacman-gui screen and spotted the “Sync DB” button. Pressing this button caused the update of the repositories within Manjaro. When I pressed the “Open PkgBrowser” button again there were no further Python errors. The PkgBrowser utility enables you to search the repositories to see what applications are available. In the top left window is a list of categories to search. These are structured by the different repository groups rather than standard categories. So instead of browsing by Audio, Games, Office etc you browse by Extras, Foreign, Community, Platform etc. The easiest way to search for applications is to enter a search term. The search tool is very powerful. You can search by simple keywords or you can use regular expressions. You can choose to search by application name or by description and various other values. It is also possible to search by scope such as only search for applications already installed or search for applications not installed. When you press the search button a list of applications appear in the top right hand corner. If you click on an item then a description appears in the bottom right hand corner. The one thing I couldn’t actually work out within Pkgbrowser is how to actually install an application. I looked through the help file but it gave no clue. Perhaps this isn’t an option which would be a shame as it means after finding the application you want to install you have to use another tool to actually install it. At this point I decided to exit the Pkgbrowser and look at some of the other options within the Pacman-gui. Another way to search for packages is to click the “Search packages” button. A much more simple interface appears. Simply enter a name or keyword of the program you want to install and click the “OK” button. Ubuntu users might get a slight shiver at this point as the results appear in a terminal window. Functionally wise of course there is no difference. The terminal window shows you all the packages that are available and there is a clear instruction that to finish searching all you need to do is press enter on the keyboard. To actually install packages you have to press the “Install Packages” button on the Pacman-gui screen. 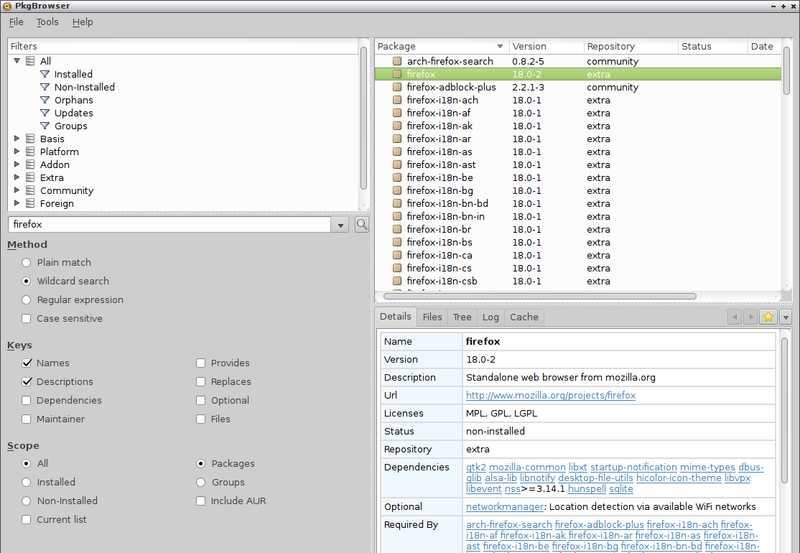 Similarly to the search function the install packages function enables you to search by name or keyword. If you search for a term such as “Gnome” and press “OK” a list of packages will appear that contain the keyword “Gnome”. 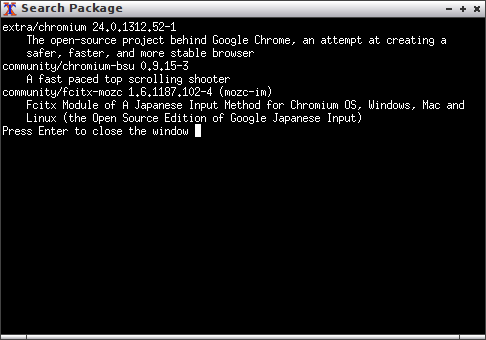 In my case I wanted Chromium so I entered Chromium in the search box and pressed “OK”. A list of targets appeared along with the total download size and the total installation size. After pressing “Y” to proceed with the installation the packages were downloaded and installed. Flash is installed by default within Manjaro and so once Chromium was installed I was instantly able to go online and watch videos. 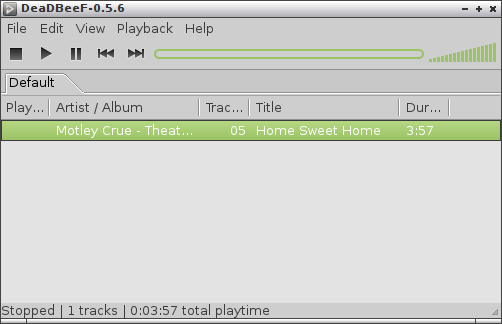 I had problems with the default music package in Manjaro which is XNoise. I tried to play a few MP3 files but I received the error “Missing gstreamer plugin: MPEG-1 layer 3 (MP3) decoder. Automatic missing codec installation not supported”. My first thought was to check the repositories to see whether I had the GStreamer plugins installed, specifically the bad and ugly packages. They are both installed by default so that was not the problem. I then searched the web but unfortunately I have not yet found a resolution to this issue. All was not lost however because instead I decided to install another music player called DeaDBeef which had no issues at all with playing the MP3s. I think my favourite thing about Manjaro is the ease of navigation. When the computer first boots in Manjaro you are shown the Synapse search tool. In this search tool you can enter the name of an application, a document, a music file, a movie, a picture or just a basic internet search term. Synapse will find all the files that match your search and will load the relevant application. For instance if you type “Chromium” into the search box then Chromium will load when you press enter. If you search for “Looks that kill” (Motley Crue, 1980s) then the default music player will load and the track will start playing. The way Manjaro is set up I can start from cold boot and be logged in to Blogger in 15 seconds within the Chromium browser. That is truly impressive. Who needs a hibernate mode? Of course if you are new to Manjaro you might not know which applications are installed and so the search tool might not help all that much. To see which applications are installed right click on the desktop and choose AppFinder. 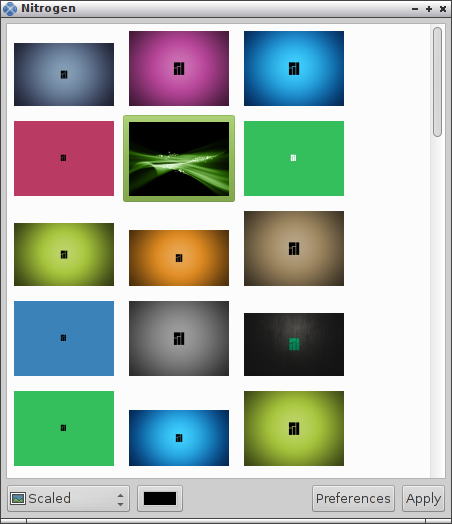 The Application Finder is a simple to use graphical tool to find the applications that are installed within Manjaro. The left hand pane has a list of categories and the right hand pane shows the applications within each category. You can use the search tool at the top to enter a keyword such as “audio” or the name of an application such as “DeaDBeef”. The following applications are installed by default within Manjaro. 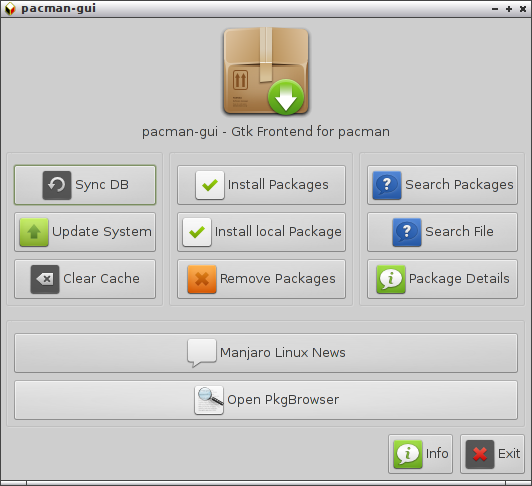 There are also various other system tools and settings programs such as Pacman, GParted and XTerm. 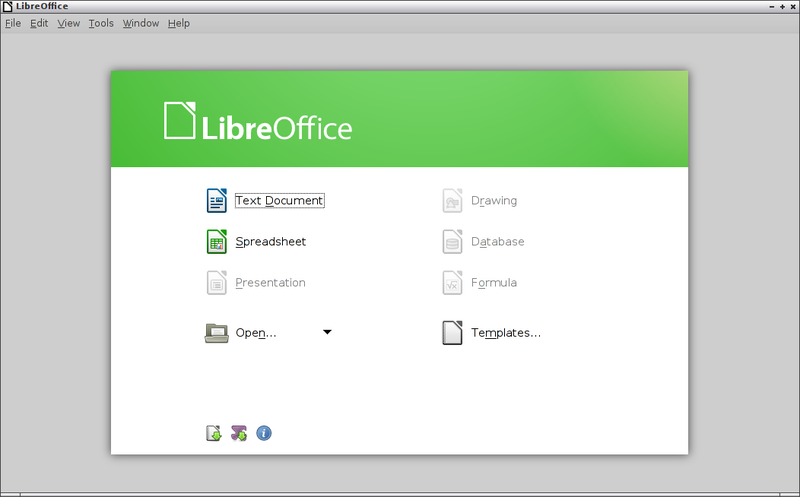 LibreOffice is not installed by default but there is a LibreOffice installer available from the Synapse search tool. 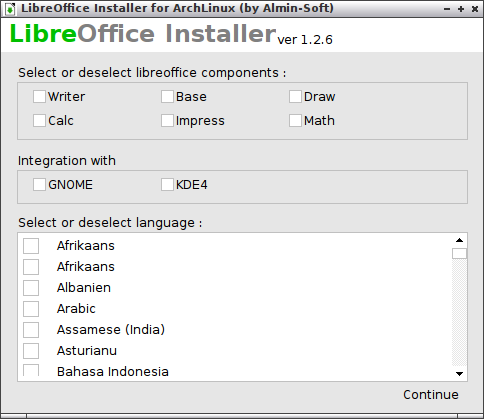 You can choose which applications to install as well as the languages. When you press continue the selected applications will be installed. I read on another forum that this application did not work very well but I can confirm that in the Openbox version of Manjaro there is no issue whatsoever as can be seen by the screenshot below. If you aren’t happy with the default wallpaper you can customise it by right clicking on the desktop and choosing the change background option. There are a number of different wallpapers available but most of them are the same theme but in different colours. If you want to choose your own image click the preferences button and click the add button to choose the folder where your image resides. Your image will then appear in the window. You can choose any of the wallpapers in the main window and when you click apply the desktop will change to your chosen image. 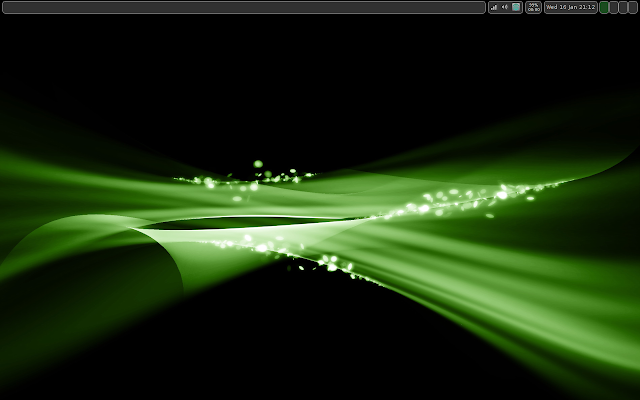 There are a lot of things to like about Manjaro Linux. First of all the boot time is amazing even on the ageing laptop that I have used to test it on. The search tool is really useful and the whole experience is fresh and clean. The taskbar at the top is unobtrusive and the AppFinder completes the set of tools needed to navigate the system. The package management isn’t quite as crisp as I’d like it. There are a number of tools that enable you to search the repositories but then do not provide a final install button. The “Install Package” option works perfectly well though. 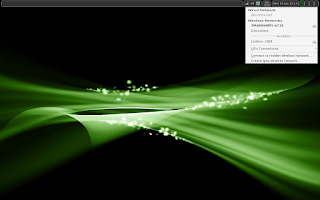 For experienced Linux users Manjaro provides a clean and highly responsive system. It is unobtrusive and you spend more time doing the things you want to do and less time having to configure the system and work out hot keys, hot spots and gestures. Excellent review! As a Manjaro team member and developer of the Openbox edition, I think that you've made some very salient points. I am pleased to confirm that we are currently working on a graphical installer (similar to those found in Mint or Ubuntu), and a user-friendly application to both search for and install software. We're getting there. Unfortunately full multimedia support is not provided 'out of the box' with Openbox, in order to keep the ISO file CD size. The special Openbox quick-guide gives instructions on how to install all the Gstreamer packages, etc. However, I will take your comments on-board about this. I absolutely agree with the review, it's right on point with my recent experience with Manjaro 0.8.3. However, my only issue is with Samba/Networking. I had a difficult time getting it to work properly. So i would suggest ( request) a more user friendly configuration (GUI tool) method for setting up Samba similar to Fedora/Ubuntu. This was all good information for a newbie to Linux. I chose Linux Live to prepare the USB to install the iso of Manjaro and it worked without any problems. For newcomers in Linux like me, what I need to know is the best software that suits with my need. And what kind of configuration I need to do first thing first after the installation. Reading this review give a quick glance that Manjaro Openbox has its own way in easing the newbie like me. Thanks for writing this review. It really help me a lot. I love Manjaro and have used the xfce and cinnamon variants of it for some time. I had a go at the openbox version but it didn't appeal to me at all. It is very fast though. I tried Manjaro Openbox and it was not quite what I wanted. Just personal preference. I tried the LXDE community spin and found exactly what I was looking for in an Arc based OS. Fast, stable and with the software I prefer. The pacman interface is similar to Synaptic, so easy to use and install the software you need. I think Manjaro has a great future and will bring even more people to Linux. Manjaro is close to Arch and a breeze to install. Installed on various devices where I want a quick install of a well done OS. Stable, fast, and so much software that is easy to install. I can't part with Arch on my main PC however Manjaro is well used elsewhere. I tried Manjaro but couldn't get it to recognise my Broadcom wifi card and after 2 days of trying I gave up on Manjaro. Actually I read this amazing review after having Manjaro installed on my hp notebook. I must say I had always anted a Minimal distro, and I'm proud to say I finally found it. It gives you what you need, install your favorite apps (thunderbird, firefox and libreoffice in my case) and you're done with a fast system. Having used debian and ubuntu based distros for 7 years now and i found that archlinux is lot less bloated and more customisable. However you can get lost very easily with the original Arch. Now with Manjaro things are simplified. I like the simple installer and pre installled multimedia drivers and players. I use xfce and mint flavours but what i like the most is the barebone net edition because then i can chose the apps that i really need. I downloaded and installed Manjaro xfce 0.8.2 alongside Linuxmint xfce Petra on my Toshiba Satellite laptop and liked it immensely. But for one little problem, I would switch entirely from Mint to Manjaro: every few times (anything between three and eight) I boot into Manjaro, the laptop just hangs halfway through the boot process. I have no idea why. In every other way, Manjaro is perfect for me.